Creating an employer branding strategy is crucial for recruiting great talent in today’s highly competitive market. One of the top high-tech companies in the world, Dell, shows us which tools and tactics can give you that competitive edge regardless of your company size or industry. 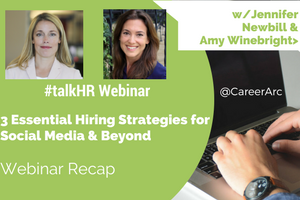 Talent acquisition and recruitment marketing professionals tuned to our 2018 Essentials List: The Must-Have Tools & Strategies To Compete for Top Talent webinar hosted by CareerArc clients Jennifer Newbill, Director of Global Talent Acquisition COE (Center of Excellence) and Amy Winebright, Global Employment Brand Project Manager at Dell, to learn best practices in order to achieve a competitive advantage in the talent market. 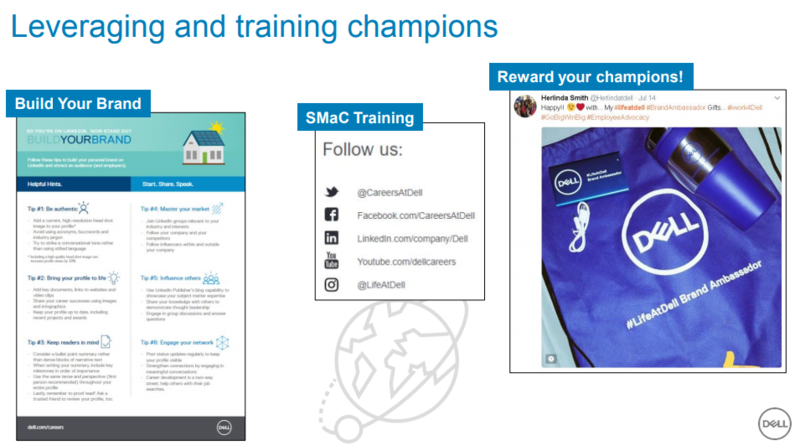 To recap this latest CareerArc the #talkHR webinar, we’ve highlighted some of Dell’s essential strategies to create an effective go-to-market toolkit. Jennifer and Amy kicked off the webinar by launching a poll asking attendees for the size of their employer branding team. A little over a third of attendees reported having a robust team of up to five members, and nearly a third have a team of five or larger. The remaining third are either managing employer branding on their own, or have yet to formalize an employer branding effort. We can likely expect that as the need for an employer branding strategy continues to grow among organizations, so too will the demand for more members to be added to maturing talent teams. Amy then took the lead for the first half of the webinar and shared some of the recruiting methods behind Dell’s success —strategies that can be used by companies and teams of all industries and sizes. How Do I Communicate My Employer Brand on Social Media? 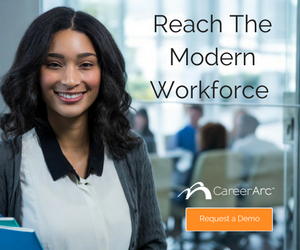 In a recent CareerArc Employer Branding study wherein we surveyed over 1,100 participants, we found 91% of job seekers visit at least one online resource to learn more about an employer’s brand and reputation. Dell takes full advantage of the active population of job candidates on social media by communicating the company’s employee value proposition on social pages methodically and effectively. One of the tactics they highlighted is one which typically earns twice the amount post views on social media: the use of images. Dell uses a variation of images, shown above. Many are of real Dell employees (and sometimes their very cute pets), all of which help convey what it’s really like to work at Dell. Jennifer and Amy have teamed up with their communications department to create images that showcase their employer brand in order to attract and engage the correct candidate they are looking to hire. In addition to these images, they also enlist the help of their internal employees to communicate their message. Since employees are ranked as the most trusted authority on a range of topics in an organization, happy employees can make a big impact on your employer brands they help exemplify and validate your employee value proposition (EVP). 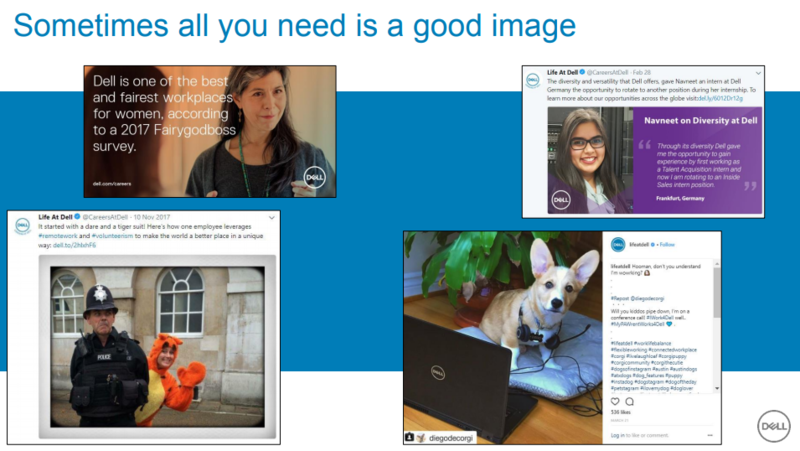 Dell shows us why it’s a worth encouraging your employees to write blog posts, share images, or post on their social media accounts. The more candidates engage with, like, and share your posts, the more your brand amplifies its reach and reinforces its message. How Do I Turn Employees Into Brand Advocates? So how can you leverage your employees to showcase your employer brand and become your best brand ambassadors? Jennifer and Amy partnered with their marketing team to create a brand ambassador program where they took their marketing department’s current social media and communities training program and enhanced it to include an extra course for employer branding. Jennifer and Amy suggest your training program should encourage your employees to post about their experience at your organization instead of having your employees feeling like they are being told what to do. Dell also recognizes and occasionally rewards their brand champions to let them know their advocacy is appreciated and to inspire others to follow their example. How Do I Create a Recruitment Marketing Content Calendar? Another webinar poll revealed that 70% of attendees do not have a social content strategy in place. Dell’s social content calendar was just the example they needed to get started. 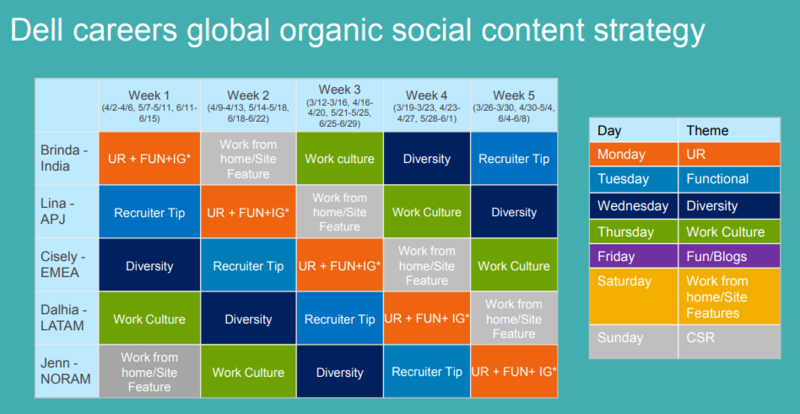 This detailed schedule helps their social recruiting leads stay organized and ensure they are balancing content topics and authors evenly across days of the week . Lastly, if diversity and inclusion hiring is a main focus for you, Dell has some great examples to emulate. Below are just a few posts of that have helped engage and attract diverse candidates. 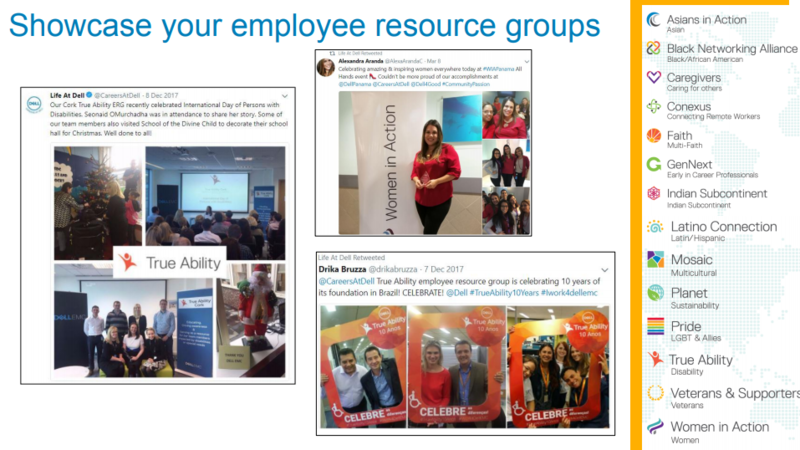 Dell’s thirteen employee resource groups allow employees to share experiences with other team members of a similar background as well as nurtures a culture of peer learning and professional development. These types of communities can often become a source for your next, big brand advocate. Want to attract high-value, high-character employees? Download and watch our Recruiting With Purpose: How to Communicate Company Values to Attract High-Value Hires webinar now. Discover the must-have hiring strategies and tools to compete for top talent in 2018 and beyond.